We love Ellen DeGeneres and when I heard her personal chef had written a book, I wanted to read it. I know not all vegans agree with me and knock her because she still works with Revlon and she’s said she eats some of her neighbors eggs and things like that but instead of focusing on what she isn’t doing, I like to focus on what she is doing. She’s on TV every day and she promotes her vegan diet and talks about what it’s done for her. She’s someone who so many people can relate to. She’s a happy vegan and it comes through. Whether she’s perfect or not doesn’t matter to me. The fact that she is spreading the word about all the benefits of eating more whole, plant based food is fantastic. Ellen and Portia have presented him with various challenges like making fried chicken and caviar and making them vegan. I think he’s brilliant. Roberto covers all the bases, breakfast, lunch, dinners, desserts, salads, lots of amazing sauces and dressings and condiments, soups, snacks and homemade pasta! There are several recipes with processed meats in the book but I think that is part of the process of moving to a new way of eating. It can be very simple. There are plenty of recipes that don’t have processed foods in them. We immediately made his mac and cheese which was really delicious. We also made his Blackening Spice which is awesome as a pumped up alternative to salt and pepper. Stella loves Ceasar Dressing and his recipe is her favorite so far. There is something for everyone in this book. If you are looking for instruction on how to veganize any recipe or just some new recipes to add to your meal rotations, this one is definitely worth picking up. This is a picture of the Blackened Tofu Ceasar Salad we made. 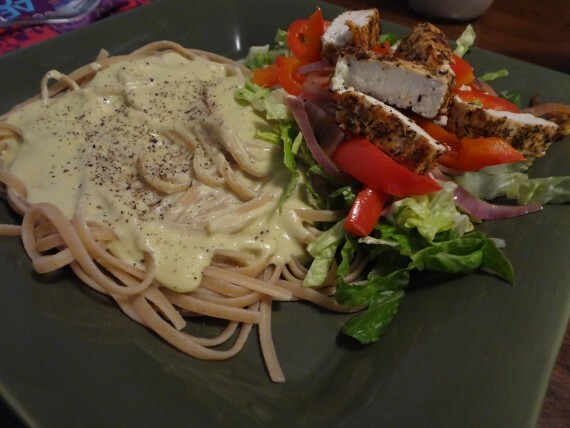 We served as a side to our Alfredo Pasta. Mmm… delicious! Some of the standouts Martin, a Culinary Institute of America-trained chef, has developed for Ellen and Portia include: Banana and Oatmeal Pancakes, Avocado Reuben, Red Beans and Rice, “Chick’n” Pot Pie, and Chocolate Cheesecake. Featuring mouthwatering photographs by award-winning food photographer, Quentin Bacon, this cookbook will appeal to die-hard carnivores and vegetarians alike.